Boss A Boomerang Bro, Fire Bro and Ice Bro. World 7-6 is the seventh course of World 7 in Puzzle & Dragons: Super Mario Bros. Edition. It is a basic, volcanic cavern level with enemies consisting of Hammer Bros, Fire Bros and Coin Coffers. This course is unlocked by taking the secret exit in World 7-5. This level is straightforward, starting with a battle, a ? Block, an battle with two Coin Coffers, another ? Block, then a boss fight at the end with a Boomerang Bro, a Fire Bro and an Ice Bro. The player has all Orb types on the Orb field. ★World 7-6 is a difficult version of World 7-6 from ★World 7, with Water Orbs disabled from the Orb field. 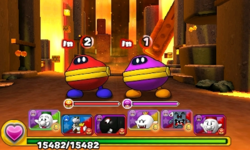 The third battle contains three Coin Coffers instead of two. This page was last edited on August 15, 2017, at 22:47.